The BioInnovation Center is a hub of start-up, non-profit lab and office facilities in the biotech industry. The goal of the facility was to serve local businesses with the overall result of creating local jobs and industries. The facility is a four-story, 64,000 SF building surrounded by the New Orleans French Quarter, university campuses, and the Treme neighborhood. The center is built on a brownfield site and was designed to help revitalize the neighborhood and generate over 200 jobs. The facility houses labs, conference rooms, breakout spaces, and a cafe. 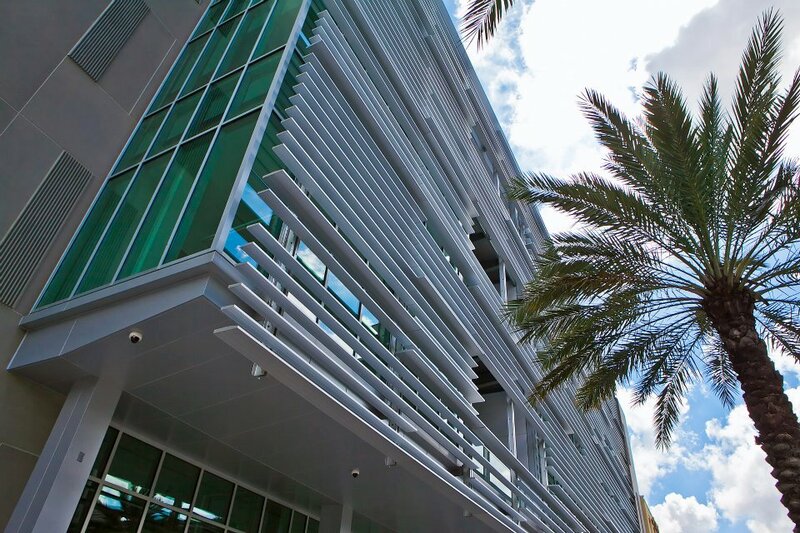 With the goal of meeting client expectation in the hot and humid gulf climate, the New Orleans BioInnovation Center had to be constructed to withstand the possibility of another Hurricane Katrina strength storm.. Because the building houses intense energy using laboratory equipment, the issue of energy efficiency was a particular challenge. However, the most impressive of all the innovations on this project was the use of precast, more specifically Slenderwall by Jackson Precast. The general contractor suggested using Slenderwall which met the needs of the architects to have a lightweight and durable material that could accommodate floor to ceiling windows. Slenderwall provides a consistent and controlled building envelope through the use of closed-cell foam insulation which acts as a vapor barrier and contributes to the air/water tightness of the panels. Precast was also a good choice because it was produced in Jackson’s offsite precast plant and delivered to the tight urban site ready to install. The limited crane access on the tight project space also made Slenderwall a perfect choice in building material. If traditional precast components had been used, a larger crane would have been needed. Slenderwall also met the local hurricane codes in terms of wind and impact resistance.